When we set out to explore indigenous families’ financial practices and different forms of currency in the highlands of Chiapas, in Southeastern Mexico, we expected to face resistance to answering out questions concerning money. The region is, after all, considered one of the poorest in Mexico and is still largely based on the “milpa system”, barter and reciprocal hand, although the indigenous way of life is facing important changes. In fact, people were quite open in providing us numbers concerning income, costs and prices, but these did not always add up in a way that made sense to us. Frequently it was the time dimension of their calculations that we had to understand, but most often we had to come to grips with the social and cultural framework within which these were construed. Here, like in many other settings all over the world, arithmetic is signified in the light of beliefs, fears and hopes. Prestige and dignity mark transactions in an important way, as does their strong trust in God, the saints and their ancestors and their fear of envy and evil spirits. However, we encountered a complex interweaving of economies, some drawing heavily on tradition, others aiming at “development”, but most, pursuing mixed strategies in their struggles to get by. While in the traditional system, men are mostly dedicated to the production of maize and other subsistence crops, in the more “modernized” sectors they grow flowers in plastic greenhouses and sell to national and international markets. 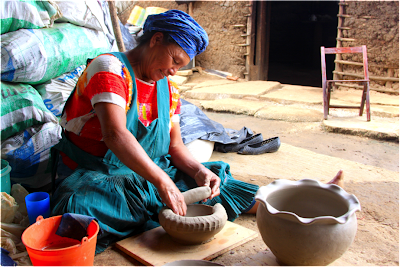 Women mostly do craftwork: in one of the villages it was the elaboration of clay pottery and objects for decoration. In the other, they weave with waist looms, using ancient techniques passed down from mothers to daughters for hundreds of years. The sale of clay craftwork and textiles represents an important cash income for their families. There’s hype, there’s reality, and there’s possibility around all the cashlessness claims that follow on the heels of mobile and other digital payment platforms. We want to conclude our guest blogging with a gesture toward some of the possibilities of mobile money--and a challenge for the Credit Slips community. The last of the Maurer and Rea guest posts is up over at Credit Slips, along with a short roundup by Katie Porter. As Janet Arnado, one IMTFI researcher, notes: "Informal wealth storing strategies exclusive of formal or informal financial institutions may always be practiced by the rural poor in the developing world, side by side with people’s utilization of financial institutions, because these practices have social dimensions as much as it has economic significance." At a Buddhist temple in Seattle, devotees build money trees to raise funds; in Ghana, brides are showered with money on their wedding day (they used to use Ghanaian currency but when it was redenominated, they could no longer afford bills. Rather than pelt the bride with coins, they switched to Nigerian naira). Cash: Killing It or Building Bridges to It? Much has been written about the inherent riskiness of cash. It is dangerous because it can be lost, stolen, eaten, destroyed, etc. It is dangerous because it is difficult to track, thereby helping to facilitate crime. Many a potboiler plot hinges on a cache of unmarked bills. Anyone remember Trixie Belden? “‘That governess of yours won’t argue when I tell her to leave a fat roll of unmarked bills under a stone at the Autoville entrance tonight. She won’t notify the police either.’ He reached up a grimy hand and touched one of Honey’s shoulder-length curls. ‘Not when I send her a lock of your pretty hair with the note, eh?’” (Julie Campbell, Trixie Belden and the Red Trailer Mystery, New York: Random House Children’s Books, 1950, p.180). IMTFI's Bill Maurer and Stephen Rea have a guest post over on the Credit Slips blog, on the recent explosion of rhetoric around the supposed "death of cash."